If you're sending emails through a connected inbox or the HubSpot Sales email extension, you can specify emails and domains that you don't want to log emails for in your settings. You can also set up this feature directly in your inbox in Gmail or Outlook. If you don't want emails sent between you and your colleagues to log in your HubSpot account, add your company email domain to this list if it has not already been added. If you add your company domain to the list, emails sent between you and your colleagues will not log in the CRM for other users in your account to see. Please note: the Never Log setting does not apply to email threads initiated by sending an email to a shared conversations inbox. Instead, you can set up email filters in your conversations inbox. In the Never Log section, click Add contact. 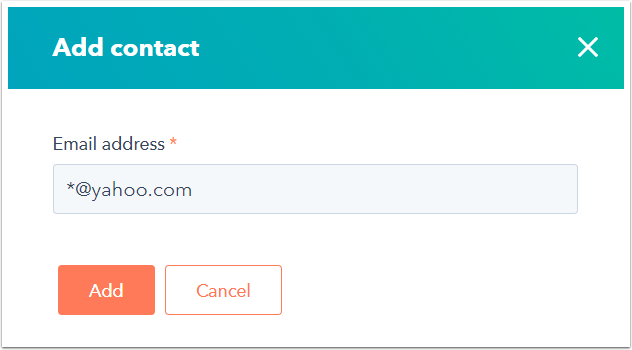 In the dialog box, enter an email address or a domain. If you're adding an email address, it must be formatted as emailaddress@domain.com. For example, name@hubspot.com. If you're adding a domain, it must be formatted as *@domain.com. For example, *@hubspot.com. Once the email address or domain has been added, account admins can prevent all users in the account from logging emails sent to the email address or domain by hovering over it and clicking Block for all users. If you want emails that you send to the email address or domains to never log, click Block only for me. To remove an email address or domain from the Never Log list, hover over it and click Remove. Please note: if you email a contact whose email address or domain is on the Never Log list, the contact will not be automatically added to your HubSpot account if they are not already an existing contact. 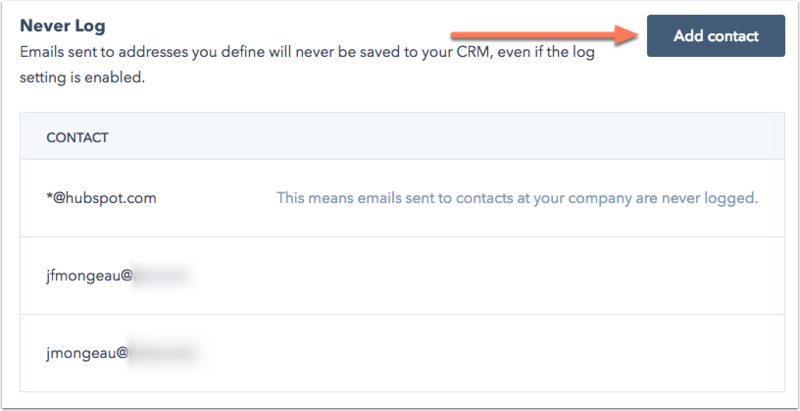 When emailing existing contacts on this list directly from the CRM, the emails will send but they will not log in the contact record.